The Ducati ST2 is the motorcycle companies version of a Grand Tourer, think Ferrari 599, a sporty mix of performance and open road usability, so it has all the fruit when it comes to performance but laden with big fairings and panniers she’s not the lightest thing going around. The design was to create a much more organic and raw feel, an almost alien like creature that wouldn’t look out-of-place in a Tool video clip but an idea in your head is one thing, bringing it to life takes a serious amount of talent and imagination. Working with the standard trellis frame the swing arm and subframe have come in for substantial modifications to suit Joe’s 6’5” build. The new subframe made in-house now houses an oil cooler, regulator rectifier and electronics and the ECU under the front section. 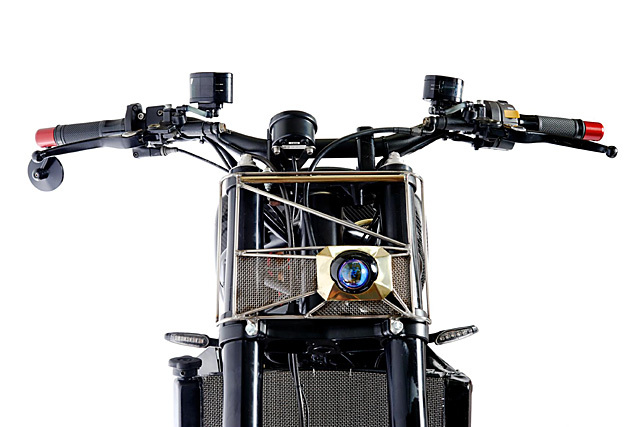 With the fairings gone the remainder of the wiring and electronics is hidden inside the main frame giving the bike an exoskeleton appearance. 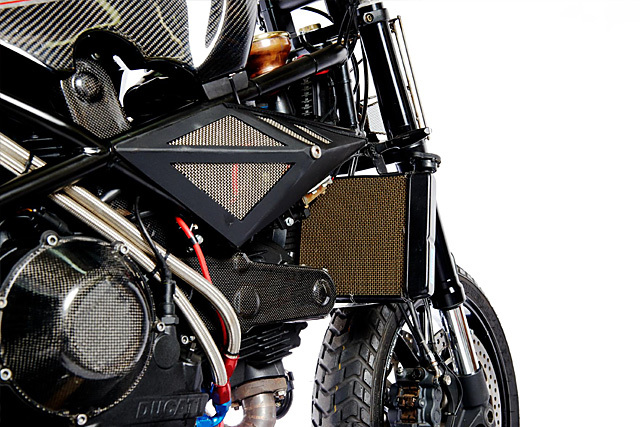 But as much as the frame modifications catch the eye and fit the bill nothing draws your attention quite like that tank! 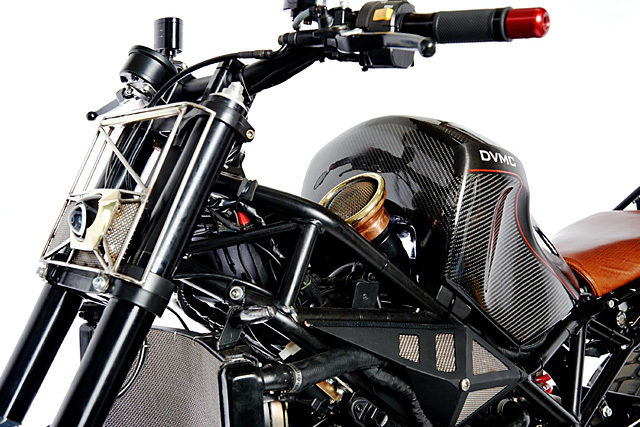 The buck for the Carbon Fibre is made completely in-house by DVMC with fabrication by Racelines Eugene Davis, a composites specialist for the ground breaking Britten Project. 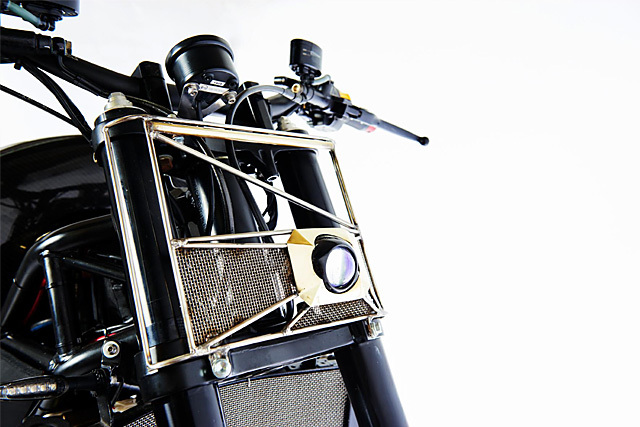 The end result is from a 5-piece mould construction with carbon fibre mount, a new modified fuel pump and regulator. Not only does it look like nothing you’ve ever seen before, it reduces a significant amount of weight and exposes the front induction area to allow freer flowing air and to display more of the components contained within the skeleton. Joe sits aboard his steed on a seat that’s base and mount was handmade before being stitched with perforated leather to suit thanks to Doyles upholstery. More raw elements come in the form of the sectioned stainless fender shaped and fitted with fabricated supports to mount to the front end. With the front area opened up and the fairings removed the Ducati 944cc, water-cooled, 90 Degree V-twin is now on full display and an enormous amount of work has gone into making it look incredible and perform just as well. With the induction on display a beautiful set of hand-built velocity stacks with formed and fitted stainless mesh filters look incredible while their internal reducers increase bottom end power. The exhaust is no less impressive, once again endless hours of hand crafted fabrication result in tuned length pipes made from pie cut sections of stainless perfectly TIG welded before being topped off with a set of mufflers from the now retired master Dennis Foran. 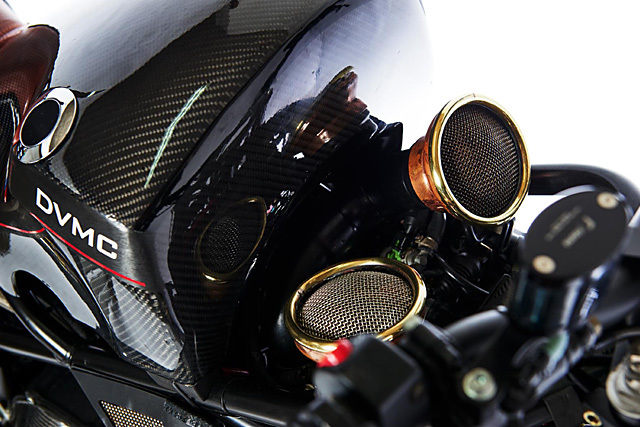 There is plenty of carbon to cover the belts and clutch housing while the radiator now wears a stainless front guard with the rear right side shielded by a brass piece. 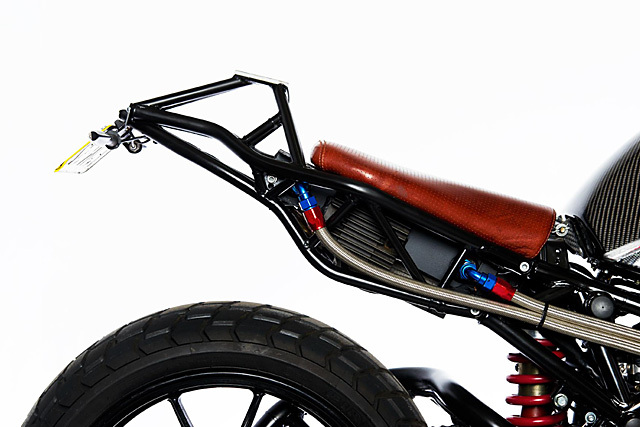 To give Joe some extra leg room a set of Kaneg rearsets sit on custom mounts and give sharp and precise operation of the shifter and rear brake. The stock Showa forks while sporty enough in their characteristics are designed to handle the substantial 233kg the Ducati weighs when stock. But with a great deal of that weight now gone and after a more fitting front, the forks and triple trees now come from a Big Bang Yamaha R1 with modified valving. These carry the enormous twin discs and g-force inducing 6 piston calipers allowing Joe to pull his ride up in fairly dramatic fashion. 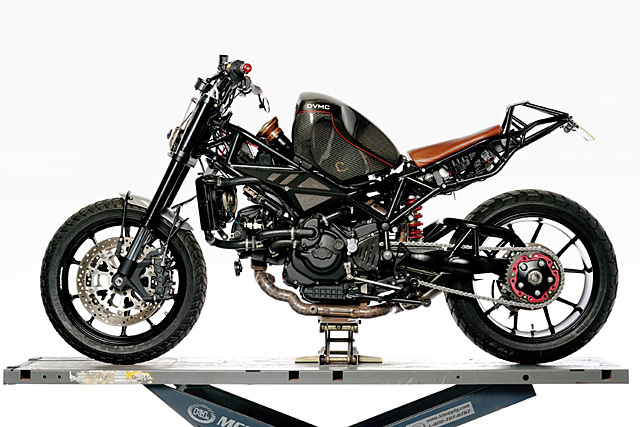 The heavily modified and strengthened single sided swingarm comes from a Ducati S2R 1000, one of the many Monster varients that is a smart choice given Ducati used a Monster frame for the ST2. The rear shock has been modified to suit Joe’s 6’5 and 115kg frame and you start to understand this is no show pony but a bike built to be ridden hard. 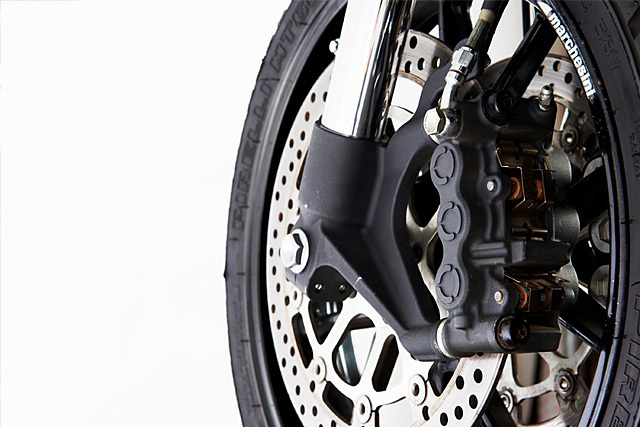 The new swingarm shows off the stunning Y-spoke Marchesini rims wrapped in purposeful Pirelli MT60 super motard tyres, 120/70-17 front and 180/55-17 out back. 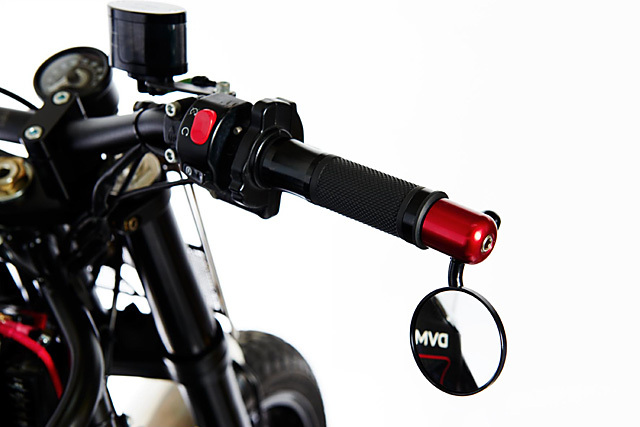 The switch gear is some of the few OEM parts left untouched on the bike but now sit on a pair of MX fat bars with knurled rubber grips and are held in place by a custom pair of machined risers. Despite the organic nature of the build Matt from DVMC explains “we also wanted to ensure the build looked like it had evolved, not gone back to basics, which meant incorporating not only hand-built components but also some technologically advanced and elegant components” and the Daytona instruments with warning light panel and speedo pick up units for electronic speedo from Vanem do a perfect job at that. But it doesn’t stop there with a Zenon dual filament h3’s acting as the headlight, an evil single eye, displayed within a hand-built brass housing. Keeping the electric system full of juice is the SSP Lithium battery hidden away in a custom fab’d box and ensures instant start-up every time with the first hit of the button. 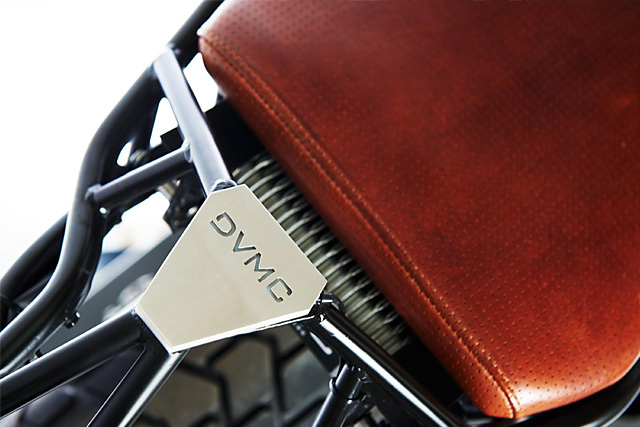 For even more of a Tool touch there is a blue LED strip under DVMC logo on the bike’s rear and Matt did the same “along the underbelly to illuminate the custom exhaust, which gives the bike a futuristic ghostly look at night, quite a sight.” Then to finish off the bike, make the most of the engine modifications and ensure everything was running just right DVMC threw the Ducati on the Dyno for tuning in collaboration with Crazy Dave at Sydney Dyno.